A raging inferno caused major damage to the Notre Dame Cathedral in Paris. Ken and Nancy LeClair of Taunton, Massachusetts, had just finished a tour of Paris' Notre Dame Cathedral on Monday and were sitting in a cafe a short distance away when they saw the smoke. "My first thing was, 'It's not on fire, Nancy, it's just a little bit of smoke,'" Ken LeClair said. "It was just like a cloud of smoke, then it started to pick up, it just kept getting worse. Then you realize this is something serious, something's going on." 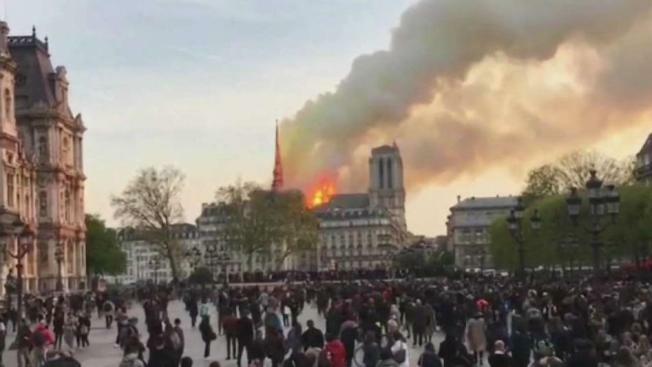 The vacationing couple had just arrived in Paris on Monday afternoon and were among the last people to tour the famed cathedral before it went up in flames. "It's such a beautiful building, inside and out," Ken LeClair said. "To have literally just walked out of it, then to see it now, it's just a terrible tragedy for sure." 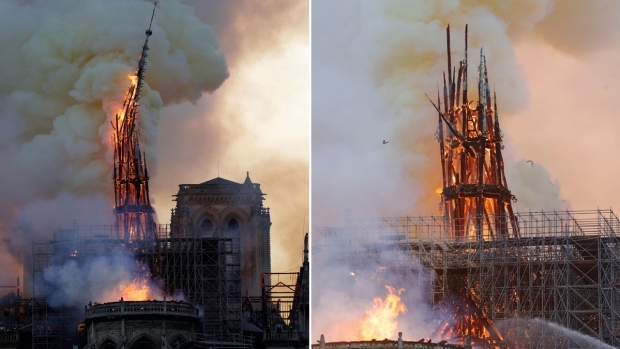 Video from the scene showed flames engulfing the spire and part of the roof, all of which were encased by scaffolding. The fire eventually spread to one of the cathedral's iconic towers. Hours after the fire started, the Paris police chief said the structure of the cathedral had been saved. Ken LeClair spoke to NBC10 Boston on Monday from his hotel room about a mile and a half away from the beloved building, describing the reaction from French citizens as they watched the iconic spire falling. "It was sad for everybody that was watching it, it was disbelief," he said. "The French people were immediately stricken, saddened. There were a lot of tears." LeClair said some were even singing hymns as the fire continued to rage. "It was quite an emotional crowd," he said. "Totally, totally emotional. For me, as well." The cause of the blaze was not known, but French media quoted the Paris fire brigade as saying the fire is "potentially linked" to a major renovation project on the church's spire and its 250 tons of lead. Paris police said there were no reported deaths. Hours after the storied Paris cathedral burned, a handful of people had gathered at the Cathedral of the Holy Cross in Boston's South End, where a prayer table had been set up near the altar. "It was on my mind a littlle bit this evening," said Mary Beezhold, who's visiting from Seatle. "It kind of reminded me of the brevity of life. Even these amazing, historical things that we make — they can be lost quickly." The centuries-old cathedral in the heart of Paris is a religious and architectural icon. According to its website, the spire, constructed in the mid-19th century, contained a part of Jesus' crown of thorns as well as two other relics, from saints Denis and Genevieve. "I think we probably didn't know how attached we were to it until it was up in flames," said Thomas Groome, a Boston College theology professor. "In a sense, it had won the hearts of the world because the beauty of it and the elegance of it just touched everybody's lives." Notre Dame announced in 2017 that it was raising funds to restore parts of the church, including the 100-meter spire, the framework for the stained-glass windows and the 12 apostles and other statues on the building. The world-famous cathedral draws about 50,000 tourists each day in the summers, according to its website. Notre Dame dates to 1163, when the foundation stone was laid. The facade was started in 1200 and the first spire was built around 1250. The structure was damaged and deteriorated through the centuries, but was rescued from possible destruction by Napoleon, and it underwent a major restoration in the mid-19th century. NBC's Asher Klein and Cathy Rainone and The Associated Press contributed to this report.